Inspired by a concept suggested by Bob Ahrenhoerster, environmental educator and operator of Prairie Seed Source, our man leaning on a rake sign lets others know everything is under control. Those of us who conduct prescribed burns know that neighbors and passersby can be alarmed and confused by vegetation fires. Post one or more of these signs near the roadside on the day of your burn to calm and educate the public. Published on Apr 24, 2012 by LIPineBarrensSociety | Watch LIPBS Executive Director Richard Amper discuss the need for prescribed burns in the Pine Barrens. Published on Apr 8, 2012 by btkolstad | Students from the Fox Valley Technical College Wildland Firefighter Program assist with a prescribed burn at the Gottfried Prairie and Arboretum on Friday, April 6, 2012. Ten acres were burned to promote the growth of native prairie plant species. 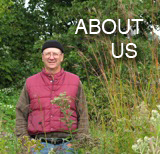 The Gottfried Prairie is made up of 42 acres of restored prairie located on the UW-Fond du Lac campus.